I know you'll agree with me that the things you want to manifest are important to you. But what if that importance was the very reason why you don't have your desire? What if that importance was the basis of all of your resistance and limiting beliefs? Would you be willing to let go? Yes! I knew you would! You see, when you make something important you create attachment to it. It's like you're sending out little cords that hook into your current reality causing it to become stagnant, not allowing it to change or evolve so that the Law of Attraction can manifest your desires. For example, when you focus on past events and think “You did this to me,” “You did this wrong,” or even “You did this right,” you make the past event important. You become attached to it, allowing yourself to continue thinking about and experiencing the emotions of that event. This only continues to create similar experiences for you. It doesn't allow the people around you to change, you to change, or your reality to change. If you're looking to attract a relationship but are focused on events in past relationships, you may find yourself creating a cycle where you create the same relationship patterns with different people…or you may find yourself having trouble repairing a relationship that you want to fix. The same thing goes for money…your weight…your career…everything in your life. Whatever you attach importance to is something that you're giving energy towards, but it's not the kind of energy you want to give. All of these things drudge up feelings of resistance – fear, worry, anger, sadness – dropping you into a lower vibration that blocks you from receiving your desire. You start noticing limiting beliefs and see all the reasons why you don't have your desire and why you can't have it. But at the basis of all this is the importance you have placed on manifesting your desire. When you let go of importance, you let go of all the blocks to manifesting your desire, allowing it to manifest rapidly. So how do you let go of importance? You can simply say, “You're not important to me anymore.” And let it go. But the key isn't to just let go of the importance of what you want to manifest. The key lies in letting go of the importance of EVERYTHING! When you let go of importance, you should feel a sense of freedom, a sense of lightness. It can feel like you're giving yourself a clean slate where you can now allow your desires to manifest even better than you imagined. You can let go of importance as often as you wish. The more you do it, the more resistance and limiting beliefs will melt away. I m in a great fix…I like this girl sooo much that I simply can’t let her go! Every time I use the visuasation…pictures won’t come to my mind…kinda forced visualisation. Even after using visualisation I feel great desperation! Last 4 days have been like months 4 me. This eagerness to get her is pissin me off and not letting me do anything! Pls pls help me with this. This article came at the perfect time! I was wondering about this when mentally going over some things I manifested years ago. Now, I’ve found the missing pieces. Thank you!!!! Sorry, please explain. I simply can’t get my head around how to on one hand be very clear about what I want to manifest, visualize it, taste it and have a strong energy about it, while at the same time not attaching importance to it. If I tell myself (and the Universe) that it’s not important, then why should the Universe “bother” to manifest it? I don’t get it! Does the Universe ever manifest things that aren’t important to you? Yes! It manifested everything in your life, even the things that aren’t important. Do the things that aren’t important to you manifest faster than the things that are important to you? Yes! Why? As Elizabeth explained, it’s because you don’t have any resistance to them. I think there is a difference (from my point of view, not the Universe’s) between conscious and unconscious manifesting. Eg. a person in debt or ill health who consciously wish to manifest money or health, will obviously attach importance to their wishes. Or am I missing something here? My question is how not to attach importance to the things you ask for – since you only (consciously) ask for things which are important to you. You use the phrase “You’re not important to me anymore” on the things that are important to you. Elizabeth explains it in the article. If you’ve already achieved something, it isn’t as important to you. You have it and you’ve moved on to creating something else. You no longer feel the desperation of not having it. You’ve attained your goal. It isn’t as important to you as it was before. So if you’re acting as if, your goal is no longer important to you. Your resistance is gone. That’s how this ties into letting go. 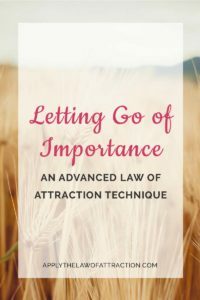 I think people are struggling with this concept because it really is advanced LOA. Elizabeth explained it well, but I think if you have something you’re trying to manifest and you really need/want it to happen, it’s even harder to understand because you’re so attached it’s the most important thing to you, and you can’t see how something so simple can work. Instead of trying to understand this logically, if people just tried it, they’d probably understand what Elizabeth is talking about. I think it’s a concept many people have to experience before they understand it. I don’t feel any desperation about manifesting that specific person and I do live as if, but it just feels strange to be ‘motivated’ to do the daily tasks (visualization, reading the relationship list and so on) if it’s something that is ‘no longer important because it’s already there’. How could I just “move on to create something else” if I still have to do all of those daily tasks (to actually manifest the person)? I’m new to the LOA, but I’ve been thinking about this post for a few days. I’m taking this to mean that I should continue to “live” and feel from a standpoint that I’ve attracted the specific person I want to ask, but at the same time realize that if I don’t end up with her, it’s not the worst thing in the world. “It is a good article on how to live a life peacefully. Letting go and setting the priority I believe would increase the quality of life. Thanks for these great insights. This is my absolutely favorite LOA technique! It helps me to “clean my slate”, so to speak, and it also helps me to detach from the specific outcome. I’ve only studied LOA for 1½ years and I already resonate with a post like this. Thank you Elizabeth for sharing this one with us, you’re truly gifted in the field of LOA!